The screenshots look so good don’t they? However, this Jenga online game isn’t close to what I hoped it would be. It’s more like a slot machine version of Jenga where you choose your win lines, place your bet and hope for the best. The Jenga game suffers from the exact same problem as Slotblox. It looks fantastic, but the actual gameplay is sorely disappointing. It’s not Jenga at all, it’s just a glorified slot machine. Don’t say I didn’t warn you. Jenga fun rating - 34%. The low fun rating of Jenga is thanks to the fact that it isn’t really "Jenga" at all. But aside from all the disappointment, is there anything fun about the game? Well, it’s fun to watch the blocks drop from the top of the window in anticipation. The "clinking" sound of the blocks is also incredibly satisfying. Watching the tower tumble is always a pleasure. From an audio and visual point of view, Jenga scores highly. However, all the pretty colours, shapes, movements and sounds in the world aren’t going to make up for bad gameplay (or lack of it), which is why the fun rating for online Jenga suffers. At least it’s not as bad as Chain Reactors though I suppose. How to play Jenga online. The basics of this version of the game. Select your stake and the number of win lines. Click to set the Jenga blocks dropping and hope that you make some lines. I know, Leslie Scott (the inventor of Jenga) would be horrified if she seen such a basic version of her game thrown on to the Internet. 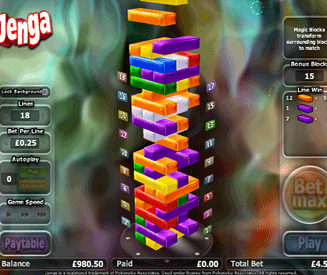 How to win money playing online Jenga. The aim of the game is to form 3 Jenga blocks of the same colour on one row. Blocks that are of the same colour and adjacent to a row with 3 blocks of the same colour will also add to your winnings. Hope that makes sense. If you have these connecting blocks (as mentioned above) in your Jenga stack, they will be removed. An equal number of blocks will then be added to the top of the tower. 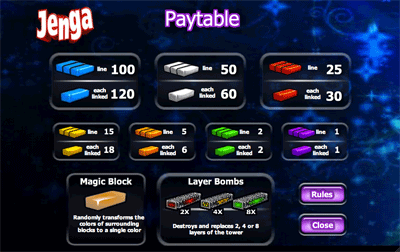 These new blocks can add to your winnings if they too have rows of the same colour. There are 8 different coloured blocks that make up the Jenga tower. Some of these blocks are more common than others, with the less common blocks becoming more valuable than the more common ones (the rarer ones result in bigger wins). If you manage to topple the Jenga tower you will be awarded with a free go. To topple the tower you must remove enough blocks from the stack. Eventually the tower will become too "top-heavy" and fall off the screen, which is always good fun. Shame it doesn’t happen more often though and isn’t more dramatic. It’s some pretty basic physics as far as computer generated graphics go. By the way, I have no idea how many blocks need to be removed from the stack to make the tower fall I’m afraid. Magic block. Transforms a handful of surrounding blocks to the same colour. Layer bombs. Explodes and removes a set number of rows around it depending on the layer bomb’s colour. Rows that are removed through the layer bomb explosion will be added to the top of the tower. Any winning rows in the vicinity will be counted before being exploded by a layer bomb, which is nice.